Been a while since I posted a Holga shot - so here goes. A few weeks ago I wandered through a clearing in the Allegan Forest, but saw nothing except for grasshoppers and flies. No dragonflies, butterflies, snakes, toads or other interesting subjects. 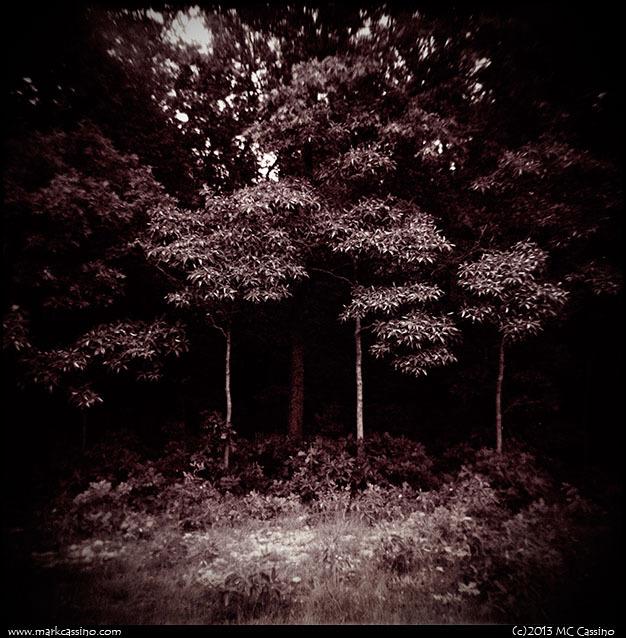 I had a Holga with me and took this shot looking back into the scrappy dense woods that look all the more dark when you are standing in bright light. Click on the image below for a larger file. Here are a some Holga shots from the last few weeks. 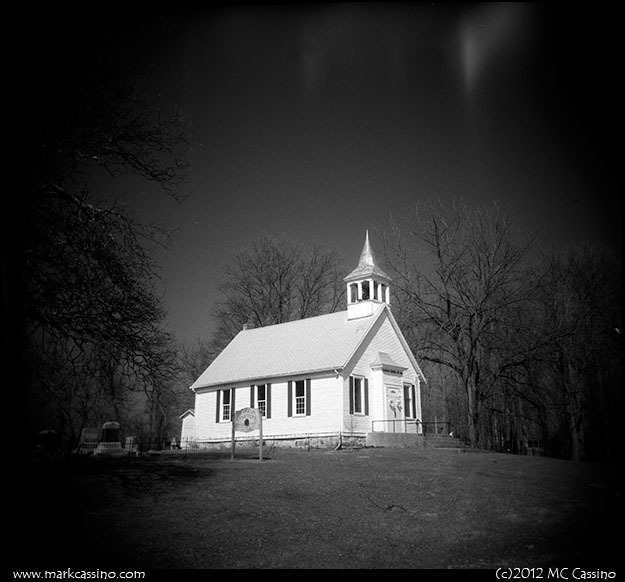 SFX is a pretty tame infrared film, but it is fast enough to be used in a hand held Holga, even with a deep red filter. 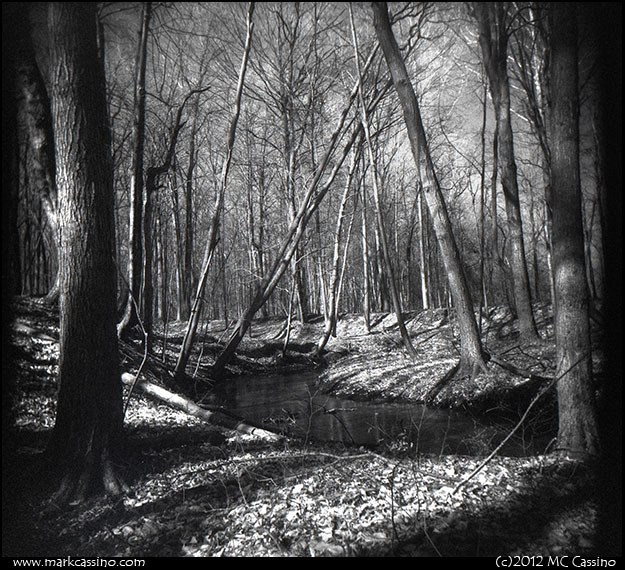 (I developed the SFX in HC-110 Dil B and pushed these exposures by one stop.) I’m hoping for some more pronounced IR effects once the green foliage is out. And here is a double exposure of a snowmobile trail, looking to the east, looking to the west …. Classic Pan 200 developed in HC-110 Dil H.
fotofoto gallery's "Your Best Shot"
Almost two weeks ago now, some good news came in the mail. 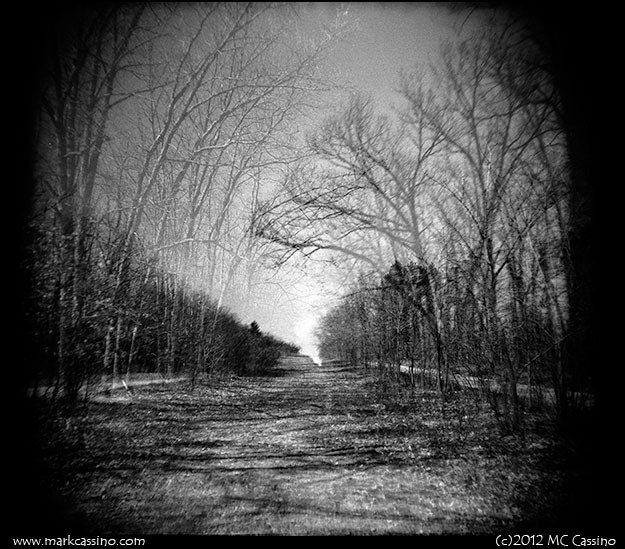 One of my Holga shots from last October was accepted into the fotofoto gallery’s “Your Best Shot” exhibit. 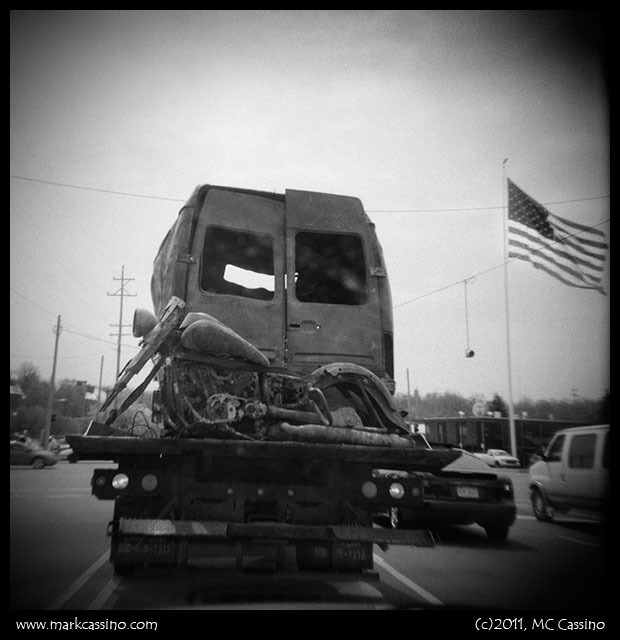 I didn’t do a lot of Holga work last year, but “Spent” was the best shot (in my mind) that I did get with the toy camera – so I’m glad to see it head off to a show. I had the photo boxed up and in the mail a week ago, so it should be there now. My Holga has spent the summer, and now the fall, sitting neglected under the passenger seat of my Subaru. I don’t mean to neglect it, but demands for my attention invariably push something away. It spent several months there with the same roll of Neopan 400 film wrapped onto its spools. Like a clock – or perhaps a bomb on a timer – the film slowly advanced as the days went by. It must have been the changes in temperature in the automobile. Every time I’d pick it up the carefully aligned frame number would be absent from the red window. When I did use it I was rusty and out of practice. There’s not much to fumble with a Holga – no aperture or shutter settings – but invariably I’d leave the lens cap in place or focus set to minimum. These discoveries would be made long after the subject and moment had moved on – so the empty squares caused by the creeping advance of the film would be next to empty frames caused by leaving the lens cap on. No matter. I finally pulled the Neopan out of the camera, mixed up some HC110, and coaxed the latent images out on the film. Two shots caught my fancy. Spent was taken in the Allegan Forest, of course. It’s not uncommon to find piles of spent ammo on the ground out there – it’s probably more uncommon to look down and not find a shell or two. But the cologne bottle? 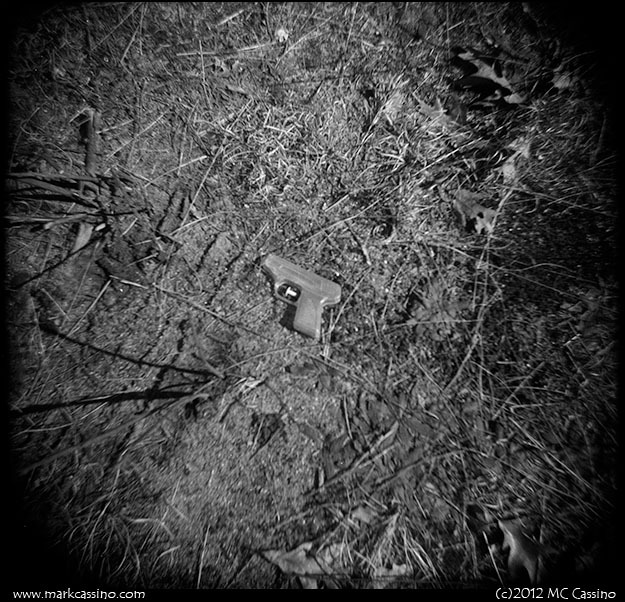 I’ve seen lots of weird things that people bring into the woods to dump or shoot at, but never a bottle of men’s cologne… This is of course a double exposure – one of those happy accidents that only the Holga can bestow. 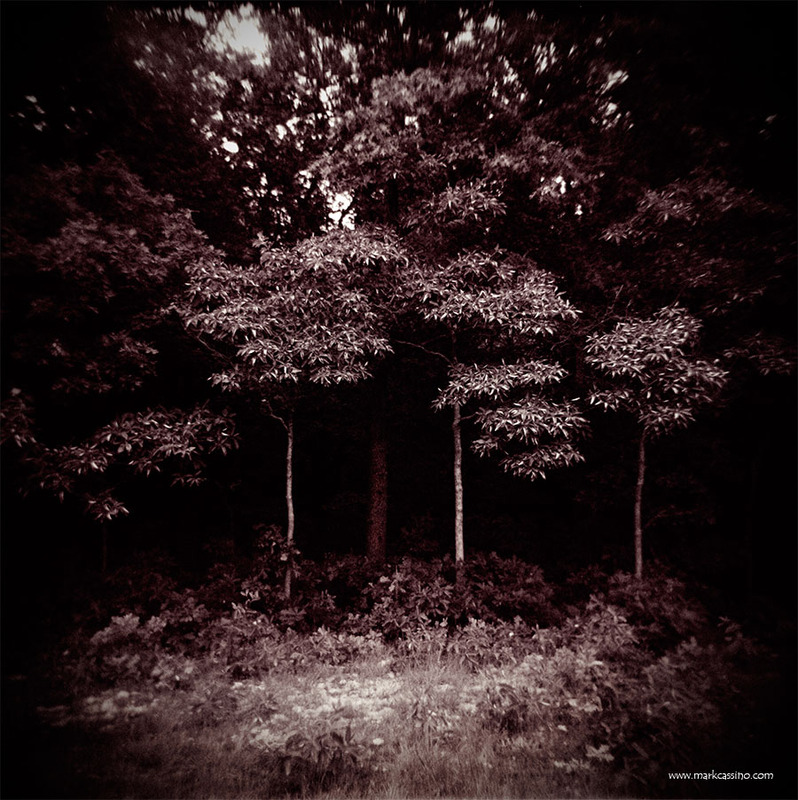 A couple of weeks ago I wrote about experiments with multiple exposures with the Holga toy camera. I’ve been continuing with these experiments – “time and motion studies” – with mixed results. Ultimately the photograph is a temporal composition – the combined effects of light and time, as opposed to light and place. Well – that’s the theory at least. I’ve encountered a few challenges in terms of pulling it off, but the process is still new. I tried for a few more shots in this genre last week, and the results are something of a mixed bag. “Rotary”, above, is a series of mad snaps taken while whirling around a rotary, shortly after sunset. The result is interesting, and I like the dynamic, but it really is a composite of several individual shots of streetlights, and not a layered-exposure, since so many areas of the frame are dark.